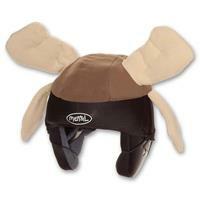 Looking for a way to make wearing ski and snowboard helmets fun for you and your family? Look no further than Mental Snow Helmet Covers! Mental's 'get committed' motto is reflected in all their the fun and crazy helmet covers designs. As an extrovert I try to make sure my appearance is as open as my personality, and if you're like me then this helmet cover is for you. Pros: Get lots of comments while in the lift line: folks think this is cute and funny.